Followed in the correct sequence, the steps in the training tree methodically prepare a horse both physically and mentally to play whatever game the rider likes to play. 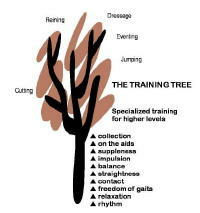 The training tree has ten levels that have to be mastered in sequence: rhythm, relaxation, freedom of gaits, contact, straightness, balance, impulsion, suppleness, putting the horse on the aids, and collection. Now, not every horse is going to have the physical ability or the mind to go to the upper levels. And more than 90 percent of the time, a horse gets limited by his rider’s ability level. But following the training tree sequence can help any horse be the best he can be. It’s nice if you can start out with a baby green horse that has no fear of people or bad habits that other people have taught him. When a horse is a blank slate, an open mind, he can come along pretty quickly. For most horses, that means spending about 2 years mastering the basic and intermediate steps. Really athletic horses with good trainers and riders may take a little less time to develop the degree of muscling they need to make it all the way to the top. No horse goes right through each level without a hitch. Horses advance and regress. As the baby green horse learns to carry weight for the first time, he may think he’s got it all figured out. Maybe he’s a little crooked right now but he’s found a place he’s comfortable. And the trainer lets the horse go along and work freely and eventually the horse starts reaching for the bit and seeking some contact with the rider’s hands. Then the trainer asks him to start moving straight and the whole deal falls apart. All those compensations for the rider’s weight that the horse figured out to keep his balance don’t work anymore because the trainer is showing him something new, asking a different question. Maybe the horse even seems to go all the way back to start and loses his rhythm for awhile. That’s alright. You’ve got to think of regression as progression. As the horse’s muscles develop so he can carry the rider’s weight and stay straight in his body at the same time, all of the previous things he’s figured out will fall back into place. Some horses fly right through two or three levels and then get stuck for awhile. Plateaus are normal, too. It’s the trainer’s job to make sure he or she has correctly shown the horse what they want. And if they have, then they need to give the horse whatever time he needs to develop mentally or physically enough to move on to the next level. Consistency is really important in training, especially with baby horses. You cannot bring any horse along in its training by riding them on an erratic schedule. You need to be working them at least four days a week. Five days are better. Now that doesn’t mean you’re going to be putting the ultimate mental and physical pressure on them every day. But you’re going to remind them of what they already know and every once in awhile introduce something new. In order for this work to carry over and become muscle memory for them, you have to be consistent. Once you have a trained horse, you can give him a week or two off and they come back fresh and haven’t forgotten anything. But a training baby is going to act like he never heard it before, he’s never seen it before and he has no idea what you’re talking about. His habits aren’t ingrained yet so it may take you a week or so to get back to where you were before you took time off. The training tree works for training older horses, too. You just start the older horse out just as though he was a baby green horse and work him up through each level. If he’s an old trooper, he’ll move right along through several levels quickly until he hits his hole, the place in his training that was skipped, or that he was never shown, or where he’s been compensating for his own physical limitations or those of his rider. So you stop there and go to work. Sometimes when an older horse has to give up an established habit, things fall apart. He seems to get worse instead of better. But, again, that’s OK. Until he figures out what his trainer is showing him and develops the muscles he needs to perform at that level, he won’t be able to move up the training tree and reach the higher levels. He’s got to untrain what he knows and retrain both his mind and body. That can take more time than if he had learned to do things the right way from the start. Cut him some slack and give him whatever time he needs. The thing you want to remember is that the training tree is a solid, sequential foundation for bringing any horse along in training. It’s something you can always turn to, whether you’re working with green horses or older horses. Each step builds sequentially on all the steps before it. When you look at the bottom of the tree, rhythm has to be established before you can get relaxation. Relaxation has to be there before you can get freedom of gaits. And so on right up the tree. You can’t skip any step because if you do, you’re going to hit the wall at some point. You’ll have to back up and go back to the level you missed and master that before the horse can make lasting progress again. The training tree applies to everything you do with your horse, even when you’re not mounted. If you go to the barn in a rush, throw the tack on and hustle the horse to the arena, you may find you have a tense or spooky horse. You’ll probably waste the first 30 minutes of your riding time because you lost all the relaxation back in the barn when you first went into the horse’s stall. Instead, if you’d approached the horse in a rhythmic way while you were grooming and tacking up, if you’d led him to the arena with a relaxed attitude, if you’d stayed rhythmic and relaxed as you made your final tack adjustments and swung into the saddle, your horse would have been ready to move out freely in rhythm and relaxation as he warmed up. You can go back to the training tree any time to help you analyze problems. Often when you’ve got a problem, it’s going to be something that was rushed or missed as the horse moved through the training sequence. The difference is that now instead of calling your horse stupid or stubborn or something else out of frustration, you have a way to back up, find what he doesn’t understand, and fix it so that he can be the best that he can be and the partner you want.